With Minnesota’s cool springs and early falls, the outdoor living season always seems a little too short for our clients’ tastes. But it doesn’t have to be. Why let the changing seasons keep you inside? Installing a fire element in your yard can extend the amount of time, often year-round, that you can spend enjoying your outdoor spaces.Whether you can’t wait to get outdoors after a long winter, you’re not quite ready to go back indoors at the end of summer, or you love the sensation of a warm fire on a cold winter night, ALD can provide the perfect outdoor fireplace or fire pit for your property. There’s nothing like the ambiance that a fire creates. Placing a fire feature in your yard doesn’t just create physical warmth. Historically, gathering around a fire is where community happens, and we believe that has never changed. An outdoor fireplace or fire pit provides a welcoming atmosphere that draws people together to share, converse and bond. If you love planning intimate evenings around the fire with your closest friends to jump start spring, making s’mores on a chilly fall evening with your spouse, or backyard camping adventures with your kids, having a place for a fire in your own backyard gives you more options than ever for entertaining and relaxing, no matter the season. We offer a variety of pre-made free-standing fire pits that can be easily moved around your yard as needed. Often compact in nature, these make a great choice for clients who have their hearts set on a fire pit but who own property with limited space. Just because they aren’t mobile doesn’t mean our built in fireplaces aren’t versatile. Every fireplace we design is made with natural stone, complete with chimney, and can be built into garden walls, outdoor kitchens or outdoor living rooms, or placed up against the house. Is there anything better than an authentic brick oven pizza? You don’t have to go out to eat to get one. Imagine getting that same great taste in your own backyard. This may be the fire feature that impresses your guests the most. Built with natural stone, our pizza ovens are sure to be the talk of your next cookout. We love custom designed work, and we love natural stone. Put those two passions together, mix in a little fire, and you get a gorgeous, one-of-a-kind fire pit for your landscape. We can create either raised or sunken pits in almost any shape or style you can imagine. If you want the campfire experience without having to load up all your camping gear or worry about camping permits, we can help you create and install a campfire set up on your property. Complete with cooking grates if you want them, our campfire features will make backyard camping feel a lot more authentic. The more modern take on a fire pit, fire tables are becoming a fun new addition to outdoor living area. We offer a variety of fire table designs and heights, including bars, dining tables and coffee tables. 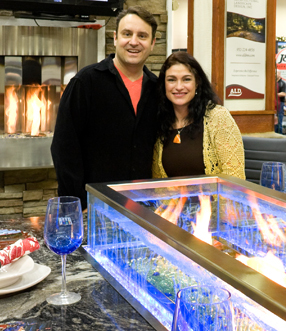 We recently introduced our patented “Elements” Fire & Water table, and we couldn’t be prouder to offer it to our clients. Since displaying the “Elements” table at various home shows, the buzz it’s created among clients both new and old has been amazing. Each table is custom produced with a solid stone top at bar height, making it perfect for snacks, dinner, or drinks. A Plexiglas barrier filled with bubbling water gives off the appearance of fire rising right out of the water. Our newest model even includes an optional heat vent to warm the area under the table. It’s a warm oasis on a cold night! Not only is our original fire table a unique piece of stone outdoor furniture, but we’re sure it will delight your guests and create a spark of conversation at your next gathering. You can read more about the “Elements” Fire & Water table by visiting our section on custom stone furniture. Often, neighborhoods and communities have ordinances or regulations regarding outdoor fire features. We can help you find out what regulations exist where you live so that you can select the right fire element for your yard. For example, generally fire pits require larger property because they typically must be set back somewhere between 20 to 30 feet from the home. In contrast, an outdoor fireplace can be right up against the home since the fire is contained and a chimney directs the heat and smoke away. Whatever the size of your available space, we can design the perfect outdoor fire element for you. At ALD, we want to make sure you get what you want. Depending on your budget and the style you’re looking for, we can show a number of options for your new fire element. Whether you’d like to choose from our selection of pre-manufactured fire pits, fireplaces or fire tables, or you’ve got a specific idea in mind and want us to custom design your fire element, we can help. All our custom fire features are created from carefully selected natural stone, which we cut to the specifics of the design. Custom-crafted stone work is becoming a lost art, but we are proud to preserve it with pieces such as our outdoor fireplaces and fire pits. You can head over to our section on custom stone and rock work to read more about our process. Don’t let the seasons dictate how you use your outdoor spaces. Send us a message or give us a call today at 952-242-9368 to chat with about designing and installing your fire pit, fire table or outdoor fireplace. We’d love to help get you outside longer and keep you warm in your outdoor living space.